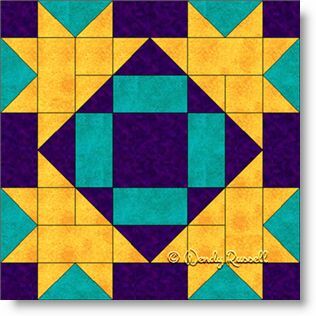 This quilt block is named Clay's Choice but there is at least one other block with that same name, so I this named this version as Clay's Choice II just to avoid confusion. I took some liberties with the construction, as I saw no need for extra seams here and there. Each rectangle was originally two squares and all of the flying geese units were half square triangle patches. Why make it more difficult? You can make your quilt go together more quickly, as this eight patch block works well as a 16" block, but I have also included instructions for smaller blocks as well. The two sample quilts illustrated give you basic ideas of how to lay out your blocks to make your special quilt.